Own He-Man Masters of the Universe - I have the Power Mug from Deff, DVD, Blu-Ray & 4K Video Specialists - Free UK Delivery..
First 32 episodes from season one on 6 DVDs. Enter Etheria, a world of wonder, a world of magic, a world dominated by the might of the Evil Horde! Join She-Ra, Princess of Power and her allies in the Great Rebellion as they battle against Hordak and his Evil Horde, a group of villains that Horde science has turned into the most evil beings on Etheria! These first 32 episodes feature the world of Etheria and its inhabitants brought to l..
Troubled by nightmares of the past The Sorceress send He-Man to Etheria, equipped with a precious jewelled sword. During a fight against the Evil Horde, He-Man is captured by Force Captain Adora and imprisoned. Adora is disturbed from her sleep by a voice, a voice which leads her to the jewelled sword and to her destiny as She-Ra.Plus 5 best episodes: Of Shadows and Skulls Sweet Bee's home Horde Prime Takes a Holiday The Stone in the..
Own Masters of the Universe - She-Ra - Princess of Power Mug from Deff, DVD, Blu-Ray & 4K Video Specialists - Free UK Delivery..
Own Masters of the Universe - She-Ra - Unicorn Mug from Deff, DVD, Blu-Ray & 4K Video Specialists - Free UK Delivery..
Own Masters of the Universe - Skeletor - Bad to the bone Mug from Deff, DVD, Blu-Ray & 4K Video Specialists - Free UK Delivery..
Troubled by nightmares of the past The Sorceress send He-Man to Etheria, equipped with a precious jewelled sword. 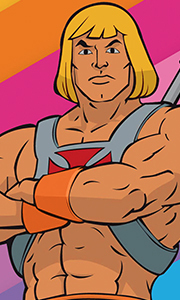 During a fight against the Evil Horde, He-Man is captured by Force Captain Adora and imprisoned. Adora is disturbed from her sleep by a voice, a voice which leads her to the jewelled sword and to her destiny as She-Ra.Special Features Feature Length Audio Commentary With The Film's Producer, Writer, Director And Voice Acto..